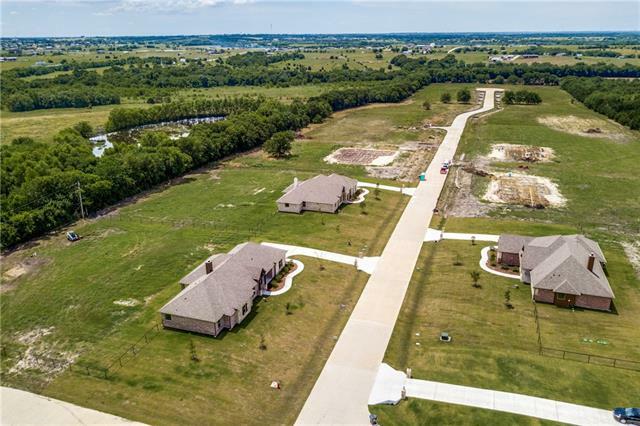 All Farmersville homes currently listed for sale in Farmersville as of 04/24/2019 are shown below. You can change the search criteria at any time by pressing the 'Change Search' button below. 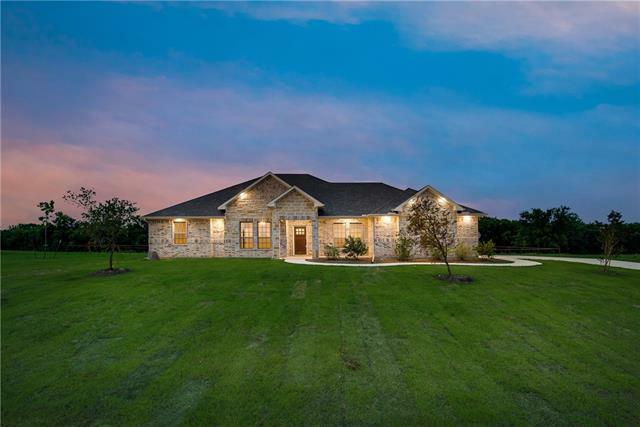 If you have any questions or you would like more information about any Farmersville homes for sale or other Farmersville real estate, please contact us and one of our knowledgeable Farmersville REALTORS® would be pleased to assist you. 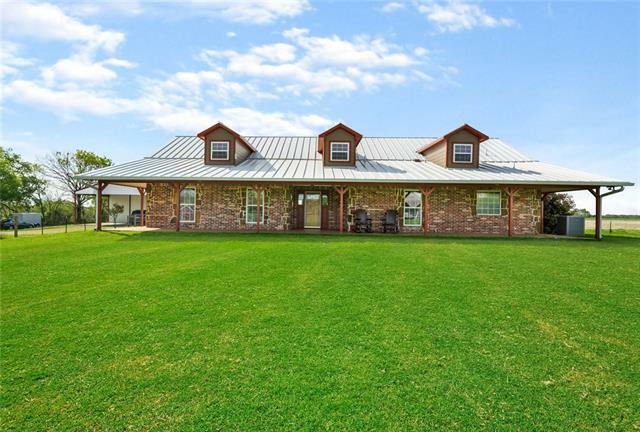 "87 or 115 ac Luxury Horse Ranch close to DFW. Main house, guest house, 3 car garage, pool, cabana, 5ac lake w gazebo & pier, water storage,generator bldg, and indoor riding arena w barn. Improvements are Utah imported Log construction. Main has open plan incl basement w mechanical rm, lg exercise rm and wine cellar. Great Rm has lg stone FP and wall of windows. Fully equipped kitchen, 3BD & 4.5BT. Lg open Master provides spa-like retreat w WBFP, garden tub, and patio w Jacuzzi overlooking proper"
"Stunning, well-maintained ranch house on 30 acres. Open concept living room and kitchen area. Granite counter tops in the kitchen with stainless steel appliances. Jack and Jill closets in the master bedroom, double vanity and garden tub. Tile and wood floors throughout. Wood-burning fireplace with beautiful stone mantle. Beautiful covered porch perfect to enjoy the sunrise or sunset on. Mobile home is on the land as an additional structure - can removed or used as a rental property. 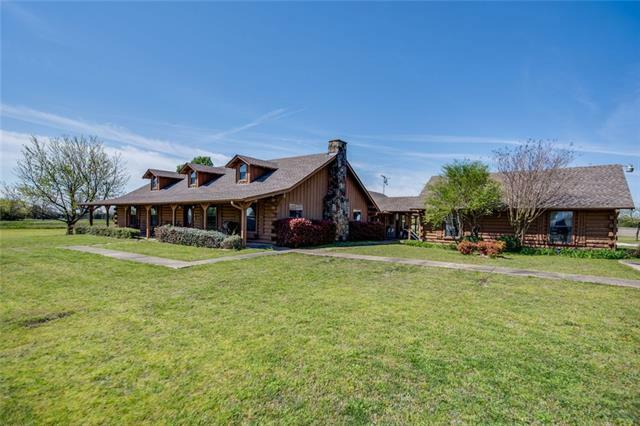 Pond is on t"
"Walk into this exquisite Satterwhite Log Home and enter your updated kitchen with granite and a beautiful backsplash. Storage abounds in this kitchen with serving bar and built in appliances. Build a fire in the wood burning fireplace and enjoy family time in your massive living room. Enjoy a relaxing country night sitting under the professionally lighted pergola watching the stars with the sounds of nature all around. 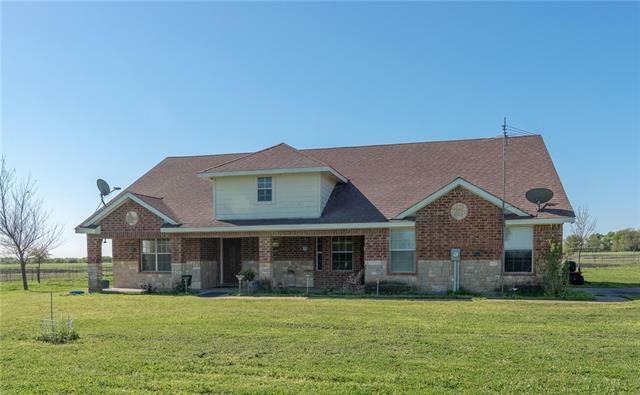 Lots of natural wood and abundant windows and skylights make for great natura"
"Custom brick home on just over 4 acres located in Eastern Collin County. 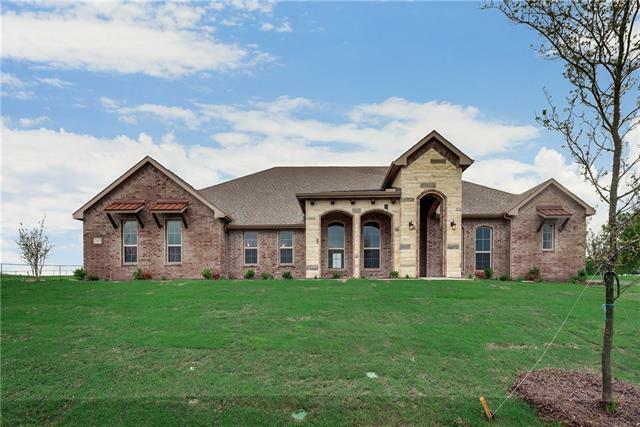 This magnificent home has custom kitchen cabinets, wood window coverings, hand scraped hard wood floors, open living concept, wood burning fire place with insert. 2 BR's down & 2 BR's up & 1 BR in game room. Out door amenities include, game room attached to home with half bath, lg fenced in back yard for family entertainment. 60X40 shop, 60X38 cow area. Area could be used for show animals for FFA projects for kids or gr"
"A Unique Ranch home set on 10 acres, built in 1983 5 bedrooms 2.5 bathrooms 1 living room 1 family room and lot of land for your Poultry animals. If you love chickens this will be the right place for you and your family a tons of indoor & outdoor space for your chickens, Custom built chicken pens. You will see stockl Pond, Fence all around the land facing to Fm 36 N. Also is an extra water meter and Septic system available. Set your Appointment." "Enjoy country living at its best! 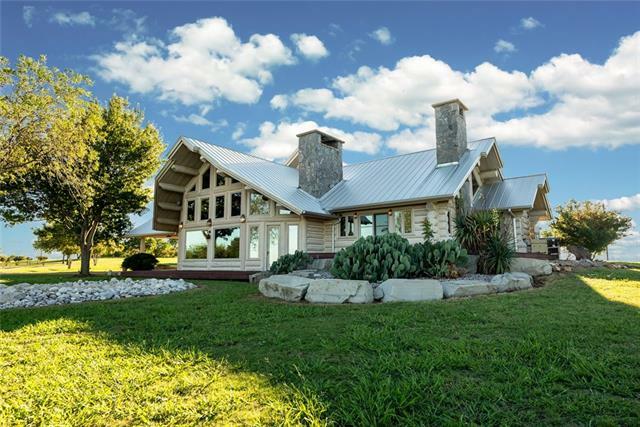 This beautiful custom home sits on 5.61 acres where you'll find yourself feeling immediately relaxed. Inside the home you will find that the living room features high vaulted ceilings that really open up the room. The master bdrm is split from the other rooms as well as the office-study, which could be used as a 4th bedroom. Above the garage, you will find a nice size room, kitchenette & full bathroom which makes for a great guest suite. The screened in porch is"
"Welcome to your dream home! 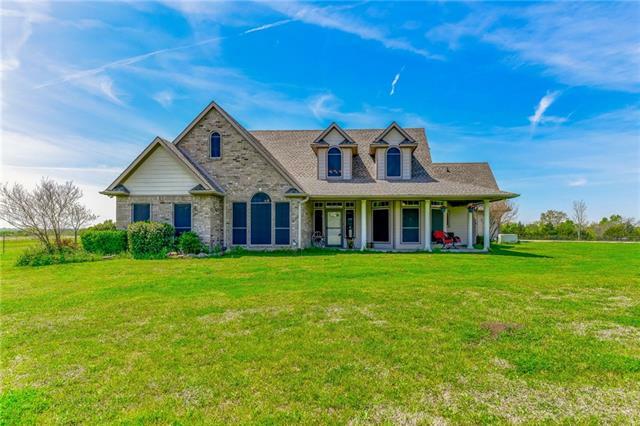 Acreage, a legit farmhouse, fruit trees, ponds, wrap around porch, barn ~ this amazing home has 11.58 total acres to convey! Wood floors. Crown moulding in main rooms. Open floorplan. Kitchen features a breakfast bar and island with smoothtop cooktop. Woodburning stone fireplace. Master bedroom has room for a sitting area and a door to the covered patio. Master bath features a garden tub, separate shower and dual sinks. All bedrooms have their own walk in "
"Location, Location, Location! 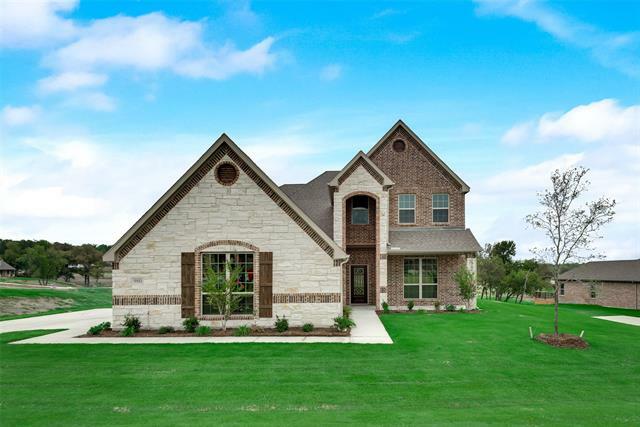 This home sits on a gorgeous 3+ acre homesite overlooking a private fishing pond! This home offers a great open floor plan for entertaining! The kitchen and breakfast room overlook the family room at the back of the house. The master bedroom suite includes a master bath with a garden tub, storage closet, and private commode. There is also his and her vanities and separate tub and shower. 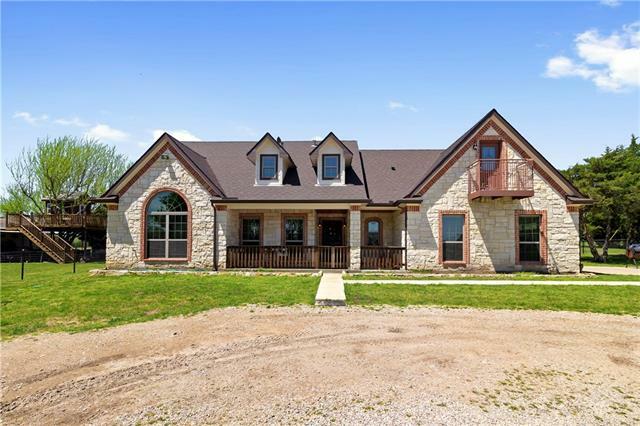 Two of the additional bedrooms are conveniently located next to each other with"
"Little bit of country & a lot to love in this CUSTOM BUILT home on 2 acres. 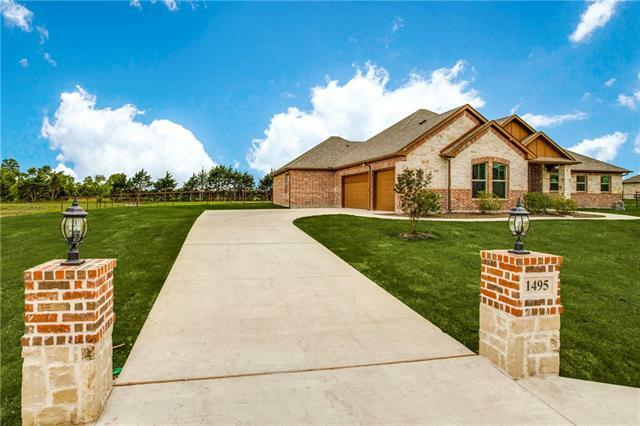 One & half story home features an open floorplan, gourmet kitchen with granite counters & SS appliances. Back door leads to peaceful covered patio ideal for entertaining. Master suite features ample room for furniture, dual vanities, double shower with 2 heads, 2 walk-in closets & jetted tub. Two more bedrooms are downstairs and share a full bath. 4th bedroom located upstairs with private bathroom, could also be game or "
"BRAND NEW CUSTOM HOME, AMAZING FLOORPLAN LOADED WITH UPGRADES, GRANITE COUNTERTOPS, CUSTOM CABINETRY, STONE ACCENTS AND FIREPLACE, EXTENSIVE TILE THRU OUT, UPGRADED CARPET IN BEDROOMS, 4 BEDROOMS PLUS A STUDY OR 2ND LIVING AREA, JACUZZI TUB IN MASTER WITH BEAUTIFUL SEPARATE SHOWER AND WALK IN CLOSETS. 3 CAR GARAGE LOCATED ON ONE ACRE WITH METAL PIPE FENCING, COVERED PATIO, LONG DRIVEWAY FOR EXTRA PARKING, THIS IS A SMALL 20 HOUSE ACRE SUBDIVISION IN THE GROWING COMMUNITY ISD AREA, If closing i"
"BRAND NEW CUSTOM HOME, AMAZING FLOORPLAN LOADED WITH UPGRADES, GRANITE COUNTERTOPS, CUSTOM CABINETRY, STONE ACCENTS AND FIREPLACE, EXTENSIVE TILE THRU OUT, UPGRADED CARPET IN BEDROOMS, 4 BEDROOMS , STUDY CAN BE USED AS FORMAL DINING, JACUZZI TUB IN MASTER WITH BEAUTIFUL SEPARATE SHOWER AND WALK IN CLOSETS. 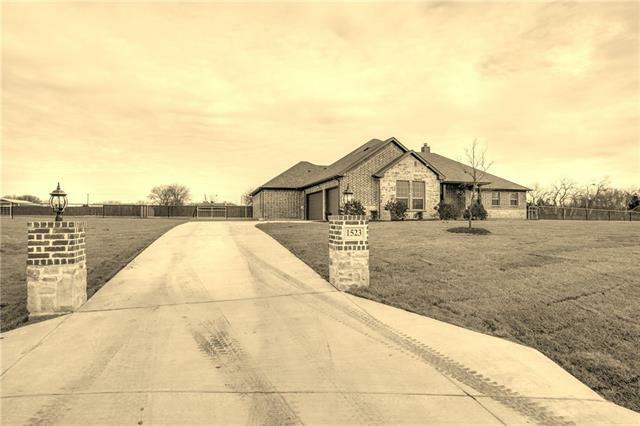 3 CAR GARAGE LOCATED ON ONE ACRE WITH METAL PIPE FENCING, COVERED PATIO, LONG DRIVEWAY FOR EXTRA PARKING, THIS IS A SMALL 20 HOUSE ACRE SUBDIVISION IN THE GROWING COMMUNITY ISD AREA, COMPLETIO"
"Gorgeous single story offering over 3200 sf! 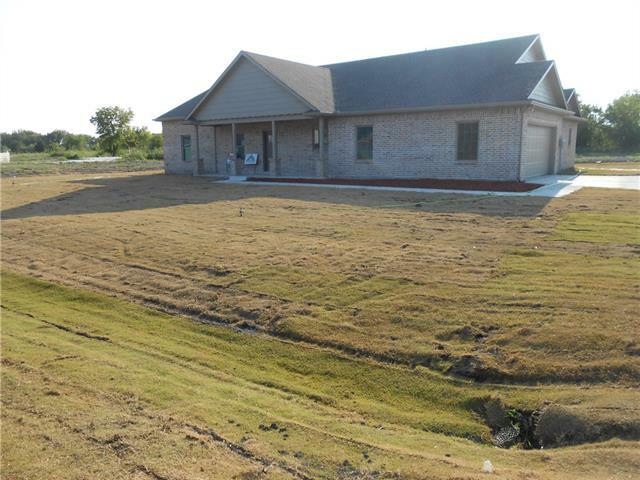 This 4 bedroom, 3 bath single story home brings a whole new meaning to spacious. Enjoy walk-in closets, large pantry, deep freezer space, media room, study, formal dining, mud room, and Flex Space! 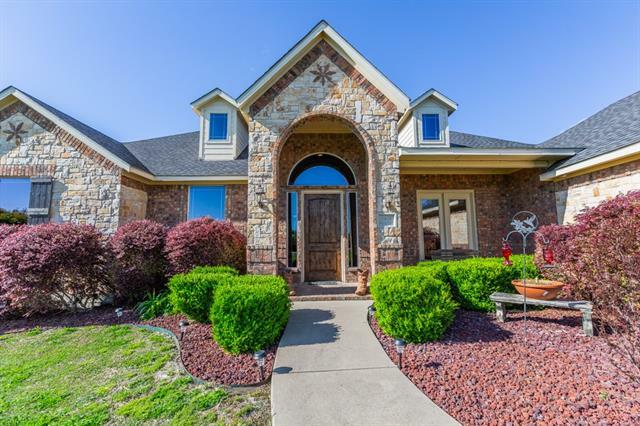 The covered front porch and back patio screams this home was meant for entertaining!" "Stunning elevations! This 4 bedroom, 2.5 bath 2 story brings a whole new meaning to spacious. Walk-in closets, corner pantry, deep freezer space, huge game room and a study or formal dining option. The covered front porch and back patio screams this home was meant for entertaining! 2 story, 4 bedrooms, 2.5 baths, formal dining or study option, game room, covered back patio"
"BRAND NEW CUSTOM HOME ,AMAZING FLOORPLAN LOADED WITH UPGRADES, GRANITE COUNTERTOPS, CUSTOM CABINETRY, STONE ACCENTS AND FIREPLACE, EXTENSIVE TILE THRU OUT, UPGRADED CARPET IN BEDROOMS, 4 BEDROOMS PLUS A STUDY OR 2ND LIVING AREA, JACUZZI TUB IN MASTER WITH BEAUTIFUL SEPARATE SHOWER AND WALK IN CLOSETS. 3 CAR GARAGE LOCATED ON ONE ACRE WITH METAL PIPE FENCING, COVERED PATIO, LONG DRIVEWAY FOR EXTRA PARKING, THIS IS A SMALL 20 HOUSE ACRE SUBDIVISION IN THE GROWING COMMUNITY ISD AREA, If closing i"
"Gorgeous home on a landscaped, 1.159 acre lot in an established neighborhood, close to shopping, dining, schools, and with easy access to highways. The elegant interior is accentuated by large windows, decorative lights, and ceiling fans throughout the home. Huge living room with fireplace is perfect for entertaining. Kitchen has tons of built-ins and ample counter space. Master suite features a luxurious master bath with dual sinks, showers, and vanities, plus a jetted tub. 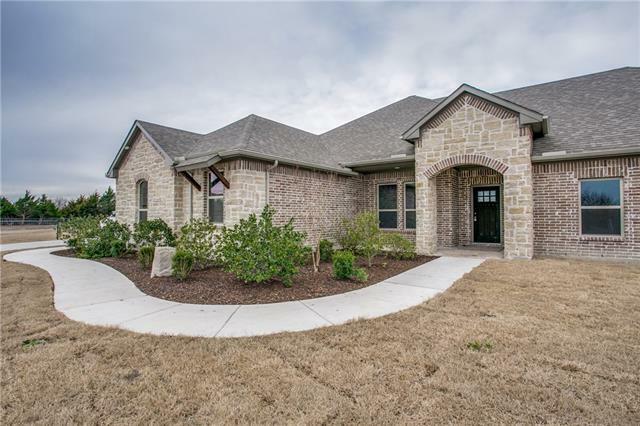 Spare bedrooms are s"
"BRAND NEW CUSTOM HOME, AMAZING FLOORPLAN LOADED WITH UPGRADES, GRANITE COUNTERTOPS, CUSTOM CABINETRY, STONE ACCENTS AND FIREPLACE, EXTENSIVE TILE THRU OUT, UPGRADED CARPET IN BEDROOMS, 4 BEDROOMS, JACUZZI TUB IN MASTER WITH BEAUTIFUL SEPARATE SHOWER AND WALK IN CLOSETS. 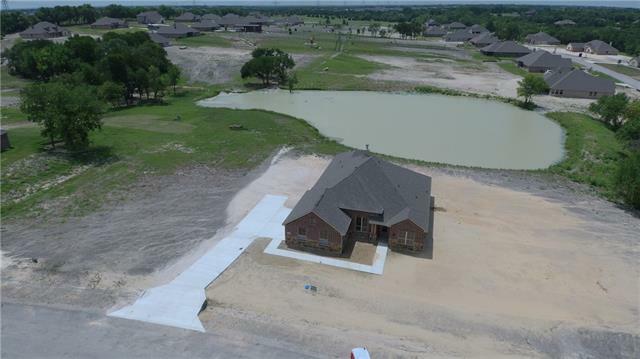 3 CAR GARAGE LOCATED ON ONE ACRE WITH METAL PIPE FENCING, COVERED PATIO, LONG DRIVEWAY FOR EXTRA PARKING, THIS IS A SMALL 20 HOUSE ACRE SUBDIVISION IN THE GROWING COMMUNITY ISD AREA, COMPLETION DATE END OF MAY, BUYER TO VERIFY S"
"Country living at its best! This home is beautiful & in a wonderful neighborhood. 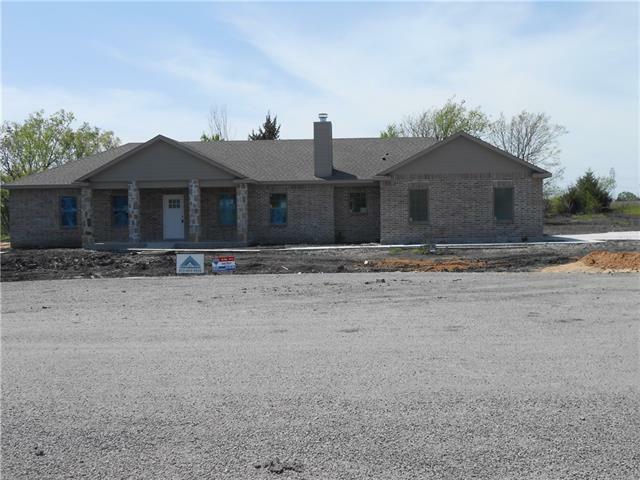 The owners are custom home builders & it has a lot of extras. 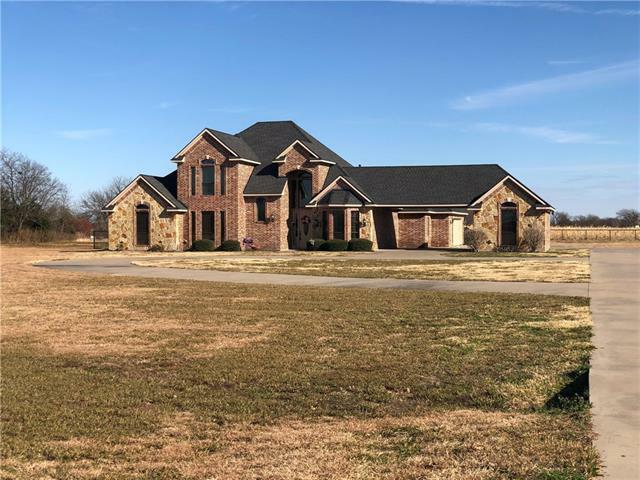 The home is 2405 sqft on 1.339 acres, 4 bdr, 1 is being used as an office, 2.5 bath, crown molding through out, lots of closets, oversize garage, 38 x 11.5 covered patio. Kitchen features granite counter tops, gorgeous natural stone back splash,walk in pantry, beautiful stained glass window, 5 burner propane cook stove & oven. There is also a 1000sf de"
"Welcome to Country Living! 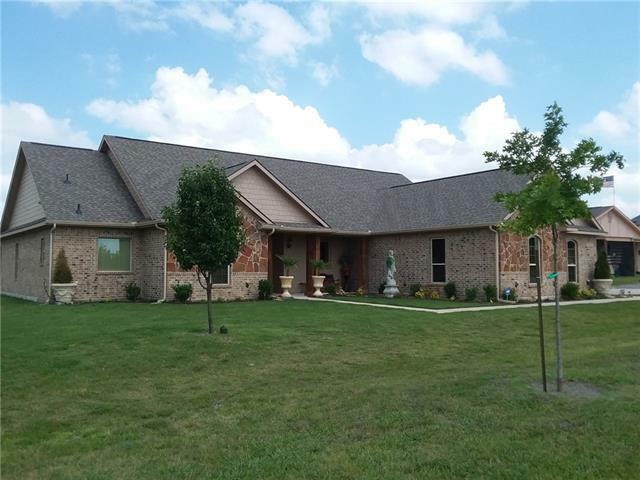 Custom Energy Efficient home on 1 plus Acre .Built w Brick & Stone Exterior. Beautiful 2100+ sqft home, one of a kind split 3 bedroom,2 & a half bathrooms.Impressive. Open concept floor plan .Open to family room, Social Kitchen, granite counter tops, plenty of counter space for preparation. Stainless Steel appliances. Large master bathroom give this home a luxurious spa like feel. No HOA. Farmersville ISD"